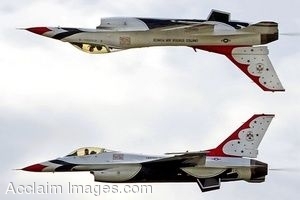 Description: Clip art photograph of Air Force Thunderbirds No. 5 and 6 perform the calypso maneuver during the 2009 Dakota Thunder open house and airshow May 30 in South Dakota. The Thunderbirds are scheduled to perform in more than 70 shows in the United States, Puerto Rico and the Far East this year. (U.S. Air Force photo/Senior Airman Anthony Sanchelli). Clipart photograph by Department of Defense Public Domain.